Spend the 6th (Sun) exploring the fascinating underwater world at Sea World Theme Park. And it doesn't end there: find something for the whole family at Warner Bros. Movie World, kick back and relax at Surfers Paradise Beach, get outside with Pelican Feeding, and make a splash at Dreamworld. 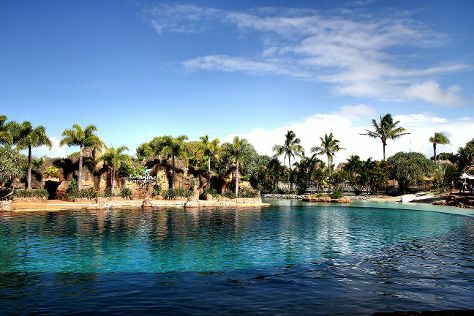 To see ratings, where to stay, more things to do, and other tourist information, refer to the Gold Coast trip planner . Singapore, Singapore to Gold Coast is an approximately 11.5-hour flight. You can also do a combination of flight and train. The time zone changes from Singapore Time to Australian Eastern Standard Time (Queensland), which is usually a 2 hour difference. Traveling from Singapore in October, things will get slightly colder in Gold Coast: highs are around 29°C and lows about 18°C. Finish your sightseeing early on the 8th (Tue) so you can travel to Sydney. Sydney is known for nightlife, trails, beaches, parks, and museums. 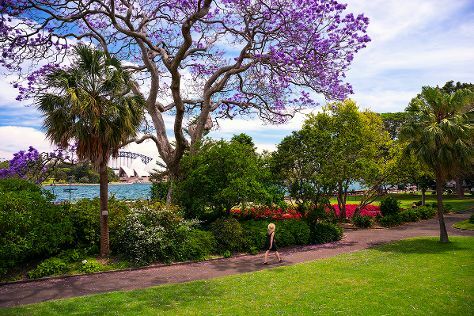 Your plan includes some of its best attractions: admire the natural beauty at Royal Botanic Garden Sydney, hunt for treasures at Sydney Fish Market, take a stroll through Darling Harbour, and see a show at Sydney Opera House. For traveler tips, maps, ratings, and other tourist information, go to the Sydney day trip tool . Getting from Gold Coast to Sydney by flight takes about 3.5 hours. Other options: do a combination of train and flight; or drive. In October, daily temperatures in Sydney can reach 28°C, while at night they dip to 17°C. Cap off your sightseeing on the 14th (Mon) early enough to go by car to Katoomba. Change things up with these side-trips from Katoomba: Bilpin Cider Company (in Bilpin), Perry's Lookdown (in Blackheath) and Norman Lindsay Gallery & Museum (in Faulconbridge). Next up on the itinerary: take in the dramatic scenery at Wentworth Falls, identify plant and animal life at Coachwood Glen Nature Trail, take some stellar pictures from The Three Sisters, and trek along Grand Canyon track. Before you visit Katoomba, use our trip planner to discover what you can do and see there. Traveling by car from Sydney to Katoomba takes 1.5 hours. Alternatively, you can take a train. Traveling from Sydney in October, Katoomba is little chillier at night with lows of 12°C. Wrap up your sightseeing on the 18th (Fri) early enough to drive to Wisemans Ferry. On the 19th (Sat), admire all the interesting features of Watkins Orchard, get great views at Hawkins Lookout, and then tour the pleasant surroundings at Convict Trail. On the 20th (Sun), you'll have a packed day of sightseeing: steep yourself in history at The Australiana Pioneer Village, then tee off at Windsor Golf Club, and then have some family-friendly fun at Planet X Entertainment. For ratings, photos, reviews, and other tourist information, refer to the Wisemans Ferry tour planner . Getting from Katoomba to Wisemans Ferry by car takes about 2 hours. October in Wisemans Ferry sees daily highs of 30°C and lows of 12°C at night. Cap off your sightseeing on the 20th (Sun) early enough to travel to Melbourne. Change things up with a short trip to The Great Ocean Road in Torquay (about 1h 40 min away). Dedicate the 25th (Fri) to wine at some of the top wineries in the area. And it doesn't end there: don't miss a visit to Royal Botanic Gardens, take in panoramic vistas at Eureka Skydeck 88, see the interesting displays at Melbourne Museum, and learn about wildlife with up-close encounters at Melbourne Zoo. To find traveler tips, reviews, ratings, and other tourist information, read our Melbourne day trip website . Use the Route module to find suitable travel options from Wisemans Ferry to Melbourne. When traveling from Wisemans Ferry in October, plan for slightly colder days and about the same nights in Melbourne: temperatures range from 24°C by day to 9°C at night. Wrap up your sightseeing on the 26th (Sat) early enough to travel back home.